The Telecom Commission of India, the highest decision-making body in the telecom department, on Friday gave in-principle approval to much awaited Pan India inter-circle Mobile Number portability. This is yet another positive news for Indian mobile users. 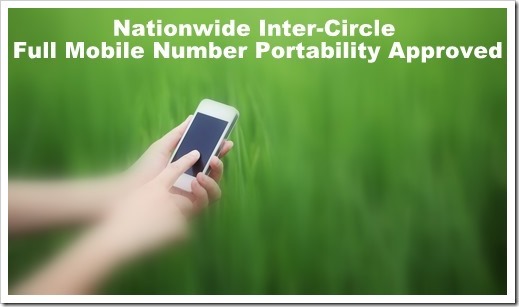 While mobile number portability was approved a couple of years back, it was only allowed to be done within a circle. So for example, if you are in Maharashtra telecom circle, you could keep your mobile number and shift to another operator in Maharashtra circle only. It was not available for users who shifted to a different circle. But now with full portability into effect, mobile users can keep their numbers and move from any circle to any circle in India. This news is very important for millions of mobile users in India who move from one state to another, or move from towns/villages to cities for jobs and businesses. They will now not need to buy a new mobile connection. They can keep the same number through the use of full MNP feature. The telecom department will now approach the sector regulator for certain clarifications, which are expected to be cleared in next 2 months. The regulators had earlier told the telecom department that nationwide MNP will require changes to the existing licenses issued to Syniverse and MNP Interconnection. Currently, both these agencies implemented the existing intra-state portability. This move is obviously going to benefit millions who move from one circle to another, but more over, the biggest benefit would be that they will be able to keep their mobile numbers. On an average, most mobile users have over 200 contacts on their mobile phones and informing everyone about your changed number is a nightmare to say the least. And when you change your number, you need to keep you earlier number active for atleast few months so you will not lose important calls. This does cost lot of money and additional head-ache of carrying 2 mobile connections at the same time. Now, that will be history. And as far as the repercussions go, telecom operators will need to even remain more competitive now. They will now be competing not only at local level, but at national level as well. The little disparity of tariff which is present in different circles will probably go away now. On the other hand, consumers also need to keep in mind that operators are now moving towards a unified Pan-India offerings. Recently, Reliance Communication had announced “One India One Rate” plan where they do not make any distinction between Local, STD and Roaming. If all providers go that way, full portability may lose its sheen a bit as well! "Nationwide Inter-Circle Full Mobile Number Portability Approved: Benefits & Repercussions", 5 out of 5 based on 1 ratings. I think this news is not genuine, as I my inter circle port request is rejected by Airtel. When did you tried to change the circle? Start Date of this facility is 31 march 2015. Mobile operators Airtel, Vodafone, Idea, RCom, and others including state-run BSNL and MTNL have announced rolling out from tomorrow the full mobile number portability (MNP) that will allow customers to retain their numbers across the country. Other private players such as Uninor, Sistema Shyam Teleservices and Videocon will also roll out the service to meet the July 3 deadline fixed by the government. Does anyone know if this is implemented?? I moved to another state and I dont want to change my number!! I am keeping same number from last 8 year and this is really a good news. I prefer to do roaming recharges compared to changing numbers everytime.